Houses & Homes VA: How to Build an Awesome Rapport with New Clients! How to Build an Awesome Rapport with New Clients! There is a difference between a client and a customer but one thing that is important to keeping both of them happy is the ability to develop a good rapport with them. Forging a solid and lasting relationship with a client requires time and effort. The secret to making it all happen is to be able to develop a friendship with a client and not only a business relationship. This is not as easy to do as it may sound but if you want to reap the rewards of increased business through “word of mouth” and personal referrals than this is one skill that you need to master. Here are 5 common sense but often forgotten rules as to how to treat clients in order to develop a trust and friendship that will benefit both of you now and in the future. When you were young you were taught to treat other people the way that you would like to be treated in return. Well, business is no different than other parts of our lives and if we want to be treated with respect and consideration we must be sure to do the same. Put yourself in your client’s shoes and imagine what you would expect in the same situation. Treat them in a manner that would please you if you were them and you are sure to develop a lasting relationship. Remember, what your client says to others about your product or service will affect you for years to come. Never exaggerate what you are able to do for your client and NEVER make promises that you can’t keep. Honesty is always the best policy and your client will appreciate the fact that you were able to do everything that you had promised in the beginning. Are you surprised to see this listed here as one of the five steps to building a rapport with new clients? You shouldn’t be! You’d be surprised how often professionals in our industry tend to be rude or “short” when speaking to clients. It’s not that anyone intends to be rude but sometimes when we are busy and pushed to the max we might not realize that we aren’t giving a client the attention that they deserve or taking enough time to explain something as thoroughly as we should. The rule here is simple: Regardless of what you are doing, nothing is more important than the time you spend speaking with a client. Take a deep breath before answering the phone or walking into the room and make the conscious decision to give that person your undivided attention. Everything else can wait because your client is your #1 priority no matter what other pressing matters you may have going on at the time. Yes, politeness counts! Small things mean a lot! Remembering your client’s name after a first meeting or conversation is good. Remembering something about them is better! Here’s a simple example that will make a HUGE impact on new clients: “Hi John, nice to hear from you again. Did you ever get your boat back in the water? It’s a nice time of year to hit the water!” As simple as this may sound it will tell “John” that you DO remember him and that he’s not just a name. He will appreciate being remembered and will be left with the impression that you are thorough and involved with your clients. This is the first step towards building a good rapport! 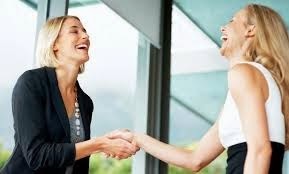 I have written many blogs in the past regarding the importance of body language when dealing with others. Even if you say all the right things your mannerisms, expressions and posture can send the wrong message. People can tell subconsciously what you are feeling by your body language even though your words may not agree. If you are not sure about how to go about controlling your body language than you might want to read these previous blogs: “Body Language Alert These 3 “Poses” Make You Look Weak!”, “How do you know if you’re a good conversationalist?”, and “Meet Dr. Lillian Glass – A Liar’s Worst Enemy”. In either case it is important to remember that our mouth is not the only way that we communicate with others and it’s important that our actions and words agree. If not, we will seem insincere or less than honest to others and that is no way to develop a good rapport!